RBTH presents a selection of views from leading Russian media on international events, featuring further analysis of the significance of the SCO and BRICS summits in Ufa for Russia, as well as reports on talks between Kabul and the Taliban in Afghanistan, and the negative effect of financial uncertainty in Greece and China on the Russian ruble. The Russian business daily Vedomosti continues to follow the SCO (Shanghai Cooperation Organization) and BRICS (Brazil, Russia, India, China and South Africa) summits in the central Russian city of Ufa (830 miles east of Moscow), noting that the level of work at them will be different. 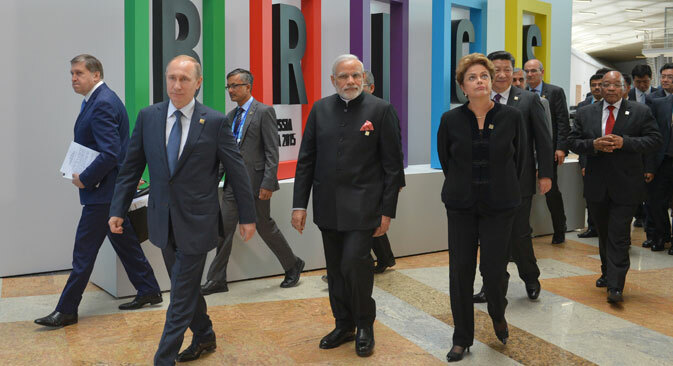 According to the newspaper, one should not expect any major breakthroughs from BRICS, since the organization has already established a development bank and a pool of foreign exchange reserves in 2014. This club is important as a prototype of a new approach to world affairs, said Fyodor Lukyanov, chairman of the Council for Foreign and Defense Policy, an independent Moscow-based think tank. “It will adopt a general, balanced declaration, because all, except for Russia, are keen to avoid any harsh statements. They approve of the criticism of the West because of its unwillingness to share power, but do not support the desire to charge into battle head-on,” said Lukyanov. The agenda of the SCO is more specific. According to Lukyanov, it is important for Russia to complete the accession of new members in order not to end up face to face with China, and to give it room for maneuver. The second task is to restore Beijing’s interest in the SCO, which was lost because of Moscow’s opposition to the initiative to create a development bank. Moscow hopes that both summits will provide fresh stimuli for developing its economy, but it seems to be alone in its euphoria, as the other partners understand the limitations of the BRICS and the SCO, according to Alexander Gabuyev, an expert with the Moscow Carnegie Center think tank. The centrist daily Nezavisimaya Gazeta writes that talks between the Taliban radical Islamist movement and the government in Kabul, which took place under the mediation of Pakistan, have become the first officially recognized contact between the two sides in 13 years of conflict. The current negotiations are important because all previous attempts to bring the warring parties to the negotiating table have failed, writes the newspaper. Observers note that this time the representatives of the Taliban are more disposed to dialogue than ever before. There are several reasons for this. In recent months, the Taliban has shown increasingly spectacular military successes; the number of deaths among Afghan security forces has increased, while a massive attack on Kunduz Province in the north was fought off only due to many thousands of reinforcements and air support from the American coalition. The second reason is the rapid advance of Islamic State (ISIS). “We can hardly expect progress in the near future, given that the parties themselves are still avoiding the word 'negotiations,'” Omar Nessar, a researcher of the Institute of Oriental Studies at the Russian Academy of Sciences, told Nezavisimaya Gazeta when asked about his views on the prospects of relations between Kabul and the Taliban. He nonetheless stressed that these contacts will go on to further intensify in the event of further successes by the Taliban. Nezavisimaya Gazeta also writes that the Greek crisis, the fall of the stock market in China and the likely removal of sanctions against Iran has led to a decline in oil prices and, consequently, to the fall of the ruble. The Central Bank continues to buy foreign currency at a rate of about $200 million every day to replenish its foreign exchange reserves, but the only person who finds these measures effective appears to be Finance Minister Anton Siluanov, says Nezavisimaya Gazeta. Oil prices remain near three-month lows. According to experts, in the worst-case scenario, the dollar will rise to 65 rubles, and oil may sag to $45-$50 per barrel. However, Dmitry Kipa, head of the analytical department of QB Finance, told the newspaper that the probability of such an outcome is low. “Negotiations are continuing on Greece, while the downturn in the financial markets is unlikely to cause significant damage to the power of the Chinese economy,” he said. Nezavisimaya Gazeta reminds its readers that the final decision on Greece’s future in the eurozone is to be taken on July 12, while an interim agreement on the Iranian nuclear issue has been extended until July 10, in spite of the efficient progress of negotiations between Iran and the P5+1 group of mediators (the U.S., Russia, China, the UK, and France, plus Germany).